DANIEL O'Donnell and wife Majella went halfway around the world to board a luxury cruise ship only to discover that eight of the staff are Irish - including one from his home county of Donegal. The couple were delighted when they embarked their plush liner, ‘The Seabourn Odyssey’, in Los Angeles, last month, to learn that they would be looked after during their trip-of-a-lifetime by young workers from Dublin, Kerry, Belfast, Down, Armagh, Louth, Cavan and Donegal. "Danielle and Denise work in the spa while Caitlin, Ciara, James, Luke, Matthew and Tamara all work between the bars and the dining rooms," said Daniel. "The staff couldn't do enough to make the trip a special experience and all of the young Irish people have made it feel like home." 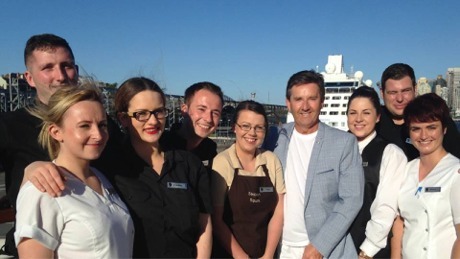 A tanned and relaxed Daniel O'Donnell pictured with Irish staff who work on board the luxury liner 'The Seabourn Odyssey'. From left are Luke from Dublin; Danielle from Kerry; Belfast native Caitlin; Matthew from Down; Ciara from Armagh; Cavan's Tamara; James from Louth and Denise from Donegal. Meanwhile, the singer (54) revealed he treated his fellow cruise passengers to an impromptu concert as they sailed across the Pacific ocean. It seems the Donegal crooner just can't stop himself singing even though it meant a Busman's Holiday on the high seas. The popular entertainer is regularly the star performer on cruise ships for guests paying to see him - but this time it was fellow holidaymakers who got to hear him for free. He also revealed that wife Majella (55) joined him on stage for a romantic duet to the delight of the audience. "Although we are on holiday, a few nights ago I did a show on board which I enjoyed very much. It's always nice to get the chance to sing," he said. "It's also a chance to keep the voice in order for our shows in Killarney in August," he said. The O'Donnells, who have so far visited Australia, New Zealand and French Polynesia, have since jumped ship and are now sailing through Malaysia on their second luxury liner. Before the couple disembarked ‘The Seabourn Odyssey’, Daniel took time out for a photograph with the ship's young Irish crew. "You may wonder why (Majella's) not in the group photo. As per usual she forgot all about the time and missed the photocall," he quipped on Facebook.